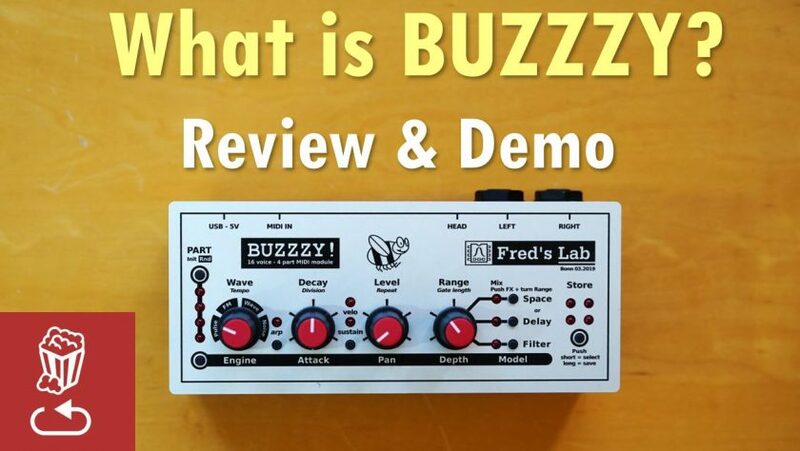 Buzzzy is a Kickstarter Synth that has quite a few interesting traits in a tiny little package: it’s a 4 part multi timbral, stereo, digital MIDI module with up to 16 voice polyphony. This review is of a prototype, but the sound engines and build are final – the panel design will change though. There are a few things that make it interesting in my opinion. First, it sounds good. Even though it’s all digital, there’s something about the bass and filter that sounds very compelling. Second – despite its very small size and close-to-Volca price – it is four part multi-timbral with stereo effects meaning that you can feed it MIDI in four channels, and each channel can play a completely different sound engine, with a different filter, and delay or reverb effect. The third thing that’s compelling here is the relatively simple interface, though of course the “price” to pay is less sound design control, as is always the trade off.